Gov. Pat McCrory and State Transportation Secretary Tony Tata last week unveiled North Carolina’s plan for road construction over the next decade and it includes the long-delayed bridge between mainland Currituck and Corolla. 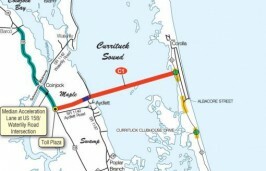 While the Mid-Currituck Bridge’s appearance in the latest draft Strategic Transportation Improvement Plan was met with excitement and hope by local and state officials, it is still not a certainty that the 7-mile-long span between the placid community of Aydlett and the bustling beaches of Corolla will be open to traffic before 2025. “Currituck County has been in support of building a Mid-Currituck Bridge since the 1970s, so we are pleased to see this project elevated to a status where it might become a reality within the next ten years,” County Manager Dan Scanlon said. The bridge will help ease traffic congestion during the summer vacation season, improve emergency medical response and evacuation time and provide for more economic development opportunities on the mainland, according to a county statement. Overall, the bridge will cost an estimated $410 million, with the state contributing $173 million, according to Jennifer Garifo, a N.C. Department of Transportation spokeswoman. “The remaining funds are anticipated to come through toll revenues generated over the life of the project,” Garifo said. The draft plan must still be given final approval in June, about the same time the N.C. General Assembly will be writing and approving a budget for the next two fiscal years. “The project will be programmed in the plan with construction scheduled to begin in 2019,” Garifo said. The draft plan calls for the bridge to take about four years to complete. Inclusion of the Mid-Currituck Bridge project in the plan announced will not change DOT’s main priority in the region — building a new Herbert C. Bonner Bridge over Oregon Inlet. The state has been ready to start construction, but litigation has delayed the project. State and federal agencies are now negotiating on a compromise that will get things started. 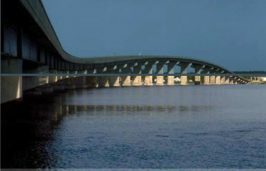 “The money for the Bonner Bridge replacement has already been allocated and this did not impact spending priorities in Division One under the new funding structure,” Garifo said. State Sen. Bill Cook, R-Beaufort, was optimistic after the plan was released. “One of the most critical obligations for the bridge is to reduce the hurricane clearance time for residents and visitors during an emergency evacuation,” Cook said in a written statement. “This transportation announcement is a key development for northeastern North Carolina, and I thank Gov. McCrory, Sec. Tata and Malcolm Fearing for their continued leadership on this project,” Cook said. Fearing, a Manteo resident, is the Division 1 representative on the N.C. Transportation Board. Nearly 1,100 projects across all transportation modes statewide are fully or partially funded under the Strategic Transportation Investments law, which created the Strategic Mobility Formula in the most recent session of the N.C. General Assembly. McCrory said the new formula takes the politics out of deciding which roads will be built by using data-driven criteria. Projects compete for dollars on a statewide level for 40 percent of the budget, a regional level for another 30 percent, and a divisional level for a final 30 percent. While the Mid-Currituck Bridge is included in the Division 1 list of projects, it was not on the state or regional lists. “With the structure of STI, projects that are not prioritized on the statewide level can then cascade down to the regional, and then division level,” Garifo said. Increasing access speed to existing economic centers are a heavily weighted factor. The regional portion for secondary highways is made up of two of the 14 divisions. Projects are then judged 70 percent on data and 30 percent on local input. Divisional projects are a 50-50 mix of local input and data. Sam Walker is the news director of Max Radio of the Carolinas and a staff writer for the "Outer Banks Voice."